The total extent of marked footpaths is around 40,000 km. Some 1,000 km of footpaths are in a suitable condition for use as cross-country ski trails in winter. Besides that another 300 km of winter cross-country ski trails are marked with a special cross-country ski trail mark. By the end of 2003, different organisations had marked over 21,000 km of cycle routes, the maintenance of which has gradually been undertaken by the Czech Tourist Club (KČT). Out of the total above, KČT has marked and maintained some 2,800 km of off-road cycle routes. The basic requirement in the course of the network building is that paths marked with the same leading colour do not join or intersect each other if possible. An accompanying rule is that the main paths are marked with red and blue marks while the secondary paths are marked with green and yellow. The whole network of marked footpaths is marked with three-stripe marks, complemented with object marks to a limited extent. The unified system of footpath marking uses square horizontal three-stripe marks of 10 cm side length, the outer stripes of which are white and the middle stripe coloured. The space between the stripes is 0.5 cm wide. The sequence of leading colours according to significance is red, blue, green and yellow. 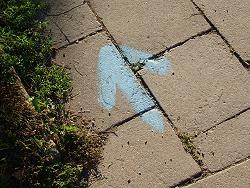 The arrow is used in the case where the marked path changes direction suddenly or branches out in another direction. If several marked paths of different leading colours pass through the same route, all the marks are placed on one object in an obligatory shape of a multicolour sign. In the vicinity of recreational or tourism centres with a high density of stripe mark network, the local object marking can also be met, which is used particularly for shorter walking circuits. A square mark of 10 cm side length is created by two equal triangles whereas the leading colour triangle is always on the right up. This mark also has its arrow design. Special white square marks of 10 cm side length with green, 3 cm wide diagonal stripe can be used for the marking of special interest trails. This mark also has its arrow design. 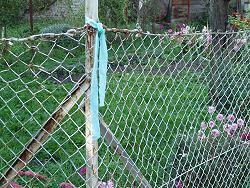 However, the special interest trails are not always marked in this way. A number of them lead along current stripe or local marking and they attain the character of special interest trails only account of information panels and special direction labels. Detours of a maximum length of 1 km leading to attractive sights disallowing the continuation of stripe or local marks, are marked with these square object marks of 10 cm side length. Also, these marks have the arrow design. A square trail-end mark of 10 cm side length is used at both ends of stripe or local marked path and at the end of each detour. European long-distance paths are led along a common network of stripe marked paths. Walkers are informed about their course by means of their symbol (such as E 8) shown in the arrowhead of fingerposts of all paths which the e-path passes. The course of these paths is shown also in walking maps of KČT. International paths are led in the same way; however there is no notice of their course in the countryside. 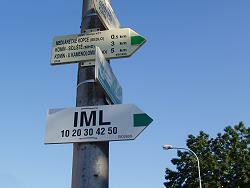 These are shown only in the walking maps of KČT. 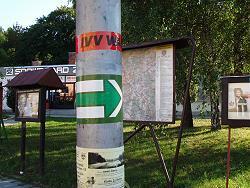 KČT is the publisher of walking maps covering continuously the entire territory of the Czech Republic. These maps contain, besides walking and geographical information, drawings of all marked footpaths, cross-country ski trails and cycle routes. The series of maps in the scale of 1:50000 (the so called green maps) serve for walking and cross-country skiing while maps of the scale of 1:100000 (the so called yellow maps) serve for cycling. In view of the fact that KČT ensures the maintenance of all marked trails in the Czech Republic, these maps provide the most reliable information about their course. 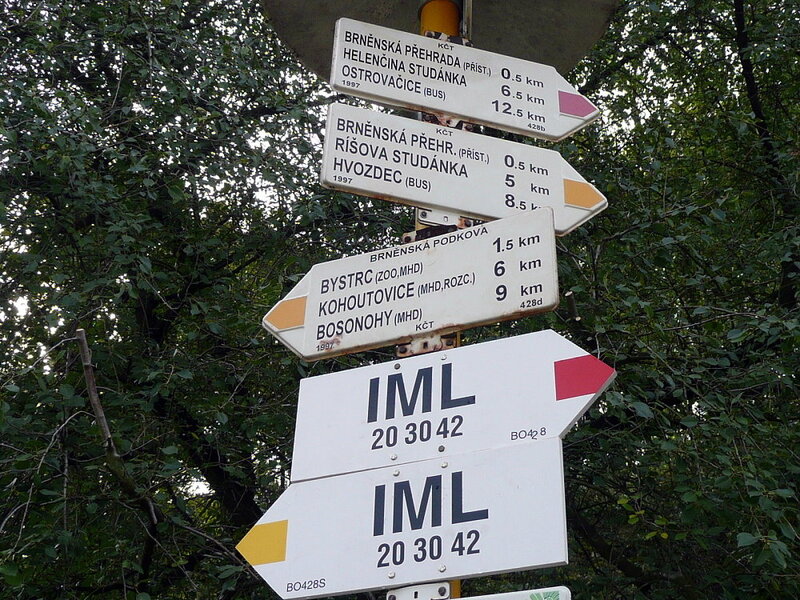 Apart from KČT, several other walking map publishers exist, whose series however do not cover the entire territory of the Czech Republic. The KČT walking maps and maps of other publishers can be bought from the existing network of bookshops.